"!!! Important notes: On your arrival a deposit of 200 Euro (cash) has to be paid, which of course you get back on the day of your departure !!! " 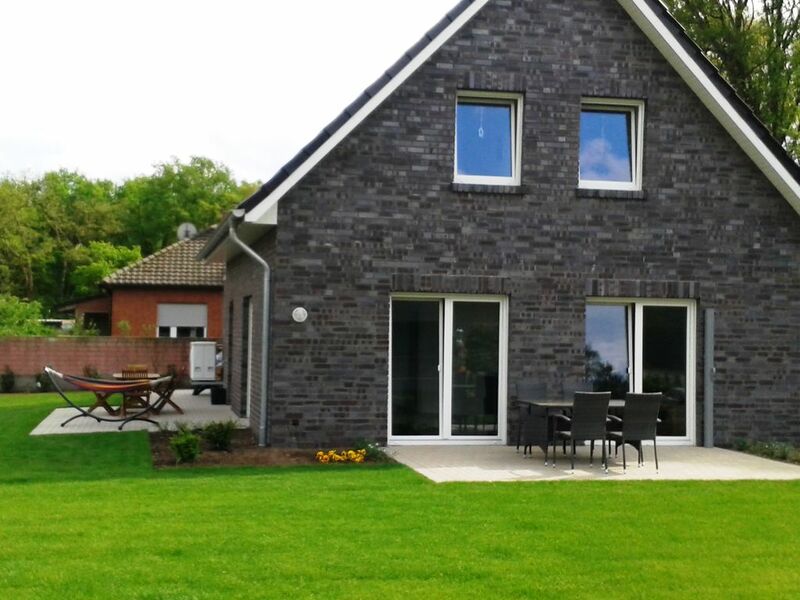 In a very special residential area with open and unobstructed views over meadows and fields is the house "House Bosse" on the outskirts of Weeze. This detached, 1½-storey, 100 m² house was built in 2017. It is about 3.5 km from the center of Weeze. In the village you will find various localities such. B. Ice cream parlors, restaurants and, of course, grocery stores such as Aldi Süd, Penny, Netto, Rewe, a drugstore "Rossmann" and a train station. 300 m from the house, on the main road, there is a bus stop, from there the buses go to the airport and on the other side of the street the buses stop in the direction of Weezer station. You like to cook, no problem with our fully and well-equipped kitchen - it's all there for you to prepare your day and / or night meals to enjoy in the large, bright kitchen, dining and living area. Stove (ceramic hob) with four plates, oven, refrigerator with freezer, microwave, coffee maker, kettle, toaster, various kitchen utensils such as pots, pans, crockery and cutlery for 12 people (cups, flat plates, deep plates, cake plates, dessert bowls, salad bowls, Glasses, etc.) and a dishwasher is of course available! You want to rest, read or watch TV, then make yourself comfortable on the corner sofa or the wing chair with footstool in the bright, comfortable living area with satellite TV and a mini stereo system. In the entrance area there is a guest toilet and the utility room with washing machine, vacuum cleaner, etc. - below the staircase you have the opportunity z. B. To turn off your stroller. You are tired, but you, your family and / or friends have at your disposal three bedrooms that can accommodate 6 adults or 4 adults with 4 children. In the 1st and 2nd Bedroom is 1 double bed (180x200 cm) and in the 3rd. Bedroom there are 2 stack beds (4 chairs - each 90x200 cm). You want to take a bath or a shower - yes, that's what you're worried about. The spacious bathroom has a bathtub and a shower. Throughout the house is tiled floor with underfloor heating. Bed linen, towels, tea towels, toilet paper are available at no extra charge. The detached house Bosse has a beautiful large garden with two terraces. Garden furniture and barbecue (Weber grill) are available and should beautify your stay in nice weather. You are not allowed to smoke in "Haus Bosse" and pets are not allowed.
! Parking is included in the house and is free! !W-LAN is available free of charge! Since the house is extremely airtight (energy efficiency requirements), we would ask you to air 2 to 3 times a day. We hebben heerlijke dagen doorgebracht in het vakantiehuis. Ruim, schoon, privacy en comfortabel. Mooie omgeving om te fietsen. Het is aangenaam fietsen langs de Niers-Radweg. een prima woning met 3 ruime slaapkamers en een grote badkamer. een mooie tuin en aan alles is gedacht. wij hebben een top weekendje gehad. ...alles wie beschrieben. Sehr nette Vermieter. Wir kommen wieder. Through Weeze meanders a small river, the "Niers" - a hiking trail (Nierswanderweg) invites you to go for a walk and cycling through woods and meadows - just typical Lower Rhine. Also raft, boat or paddle tours on the "Niers" are bookable in town. Very nice for your children is the Weezer zoo with petting zoo (free) and a large playground in the countryside. Children and adults will have fun all day at the amusement park "Irrland" in Twisteden. The park is open all day and is a highlight in fine as well as in bad weather. Not far from Weeze (about 7 km) is the famous pilgrimage Kevelaer (www.kevelaer.de). In addition to the famous basilica, Kevelaer offers nice little shops, restaurants, cafes. Castle Moyland (20 km) is a restored moated castle with a restaurant, art museum (including works by Hugo Beuys) and a beautiful outdoor area. In the footsteps of the Romans, the cathedral city of Xanten (about 22 km) offers an archaeological park with reconstructed buildings of a Roman garrison town with hostel, harbor temple, amphitheater, etc. Located close to the Dutch border, the house offers an excellent starting point to get to know the Dutch landscape, towns and places. Arcen (about 25 km) is located on the river Maas. It is a typical Dutch village, cozy with cafes and restaurants overlooking the river. Arcen is known for its thermal baths and flowering castle gardens. National Park De Maasduinen (NL) - (about 15 km) is a natural, beautiful, scenic area - walking there is an absolute pleasure. The Lower Rhine is relaxing in nature.